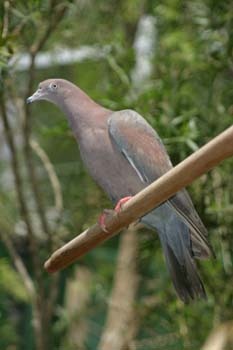 The Puerto Rican plain pigeon (Columba inornata wetmorei) was common and widespread in the foothills and valleys of Puerto Rico in the 1800s, but declined to near extinction in the 1920s and 1930s due to unregulated hunting, clearing of forests for agriculture, and hurricane damage to forests . It was feared to be extinct when a small population was discovered in eastern Puerto Rico in 1963. It was placed on the endangered species list in 1970 and has increased in size and range due to a prohibition on shooting, protection and restoration of forest habitats, and a captive breeding program (established at the University of Puerto Rico’s Hamacao Campus in 1984). A study which calibrated for survey effort determined that the population in the study area (the species' core habitat) increased from 100 birds in 1973-1983, to 218 in 1986-19992, to 3,277 in 1997-01 . However, the population was lower in 2002-2005 than in 1997-2001. The area of occupancy increased, but remains limited to eastern Puerto Rico. Forest cover in eastern Puerto Rico increased from 1977 to 1989 as abandoned agricultural and pasturelands turned to forest; but it declined from 1989 to 1995 as development began to encroach on those forests . Though the overall trend was positive, the recent negative trend is of concern. Hurricanes Hugo (1989) and George (1998) destroyed forest habitat and reduced pigeon numbers, but the impact was short-lived. The 1982 U.S. Fish and Wildlife Service recovery plan calls for the establishment of two populations with at least 250 nesting pairs each . The total population is much larger than 500 pairs, but it is not clear (to us) if they exist in one or more distinct populations. Regardless, it questionable whether 500 nesting pairs constitute a non-endangered status in Puerto Rico's current landscape. The recovery plan should be updated and a population viability assessment should be conducted. Rivera-Milán, F.F., C.R. Ruiz, J.A. Cruz, M. Vázquez, and A.J. Martínez. 2003. Population monitoring of Plain Pigeons in Puerto Rico. Wilson Bulletin 115: 45–51. Rivera-Milan, F.F. 2005. Monitoring of pigeon and dove populations on Puerto Rico and Territorial Islands (1986-2005). U.S. Fish and Wildlife Service, unpublished manuscript, October 3, 2005. Rivera-Milán, F.F., C.R. Ruiz, J.A. Cruz, and J.A Sustache. 2003. Reproduction of Plain Pigeons (Columba inornata wetmorei) in east-central Puerto Rico. The Auk 120(2):466-480. USFWS. 1982. Puerto Rican Plain Pigeon Recovery Plan. U.S. Fish and Wildlife Service, Atlanta, Ga. 52 pp.